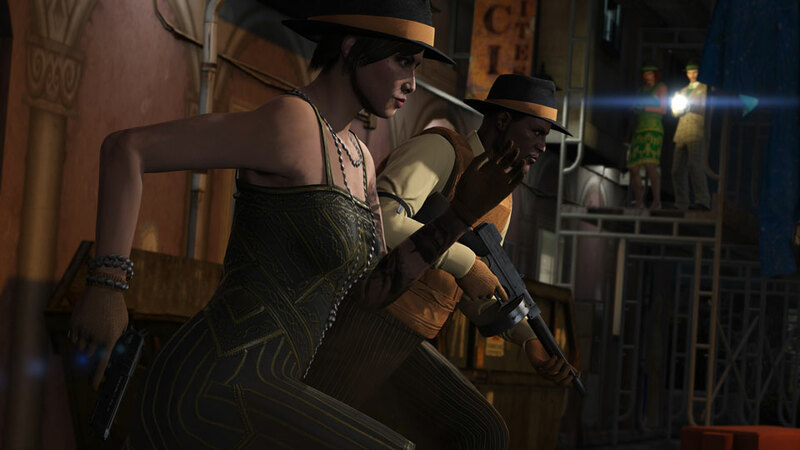 This Valentine’s week, pair up to prosper with updates for Till Death Do Us Part and Double GTA$ & RP across various couples-only game modes through Monday, February 27th plus discounts on everything from Valentine’s themed clothing to Benny’s Upgrades. Love is in the air and it’s raining down Double GTA$ & RP for all couples in fan-favorite Adversary Modes. Till Death Do Us Part is back with two romantic new locations in Legion Square and La Puerta. Stick by each other for quicker health regen and remember to look out for your partner because if they die, so do you. 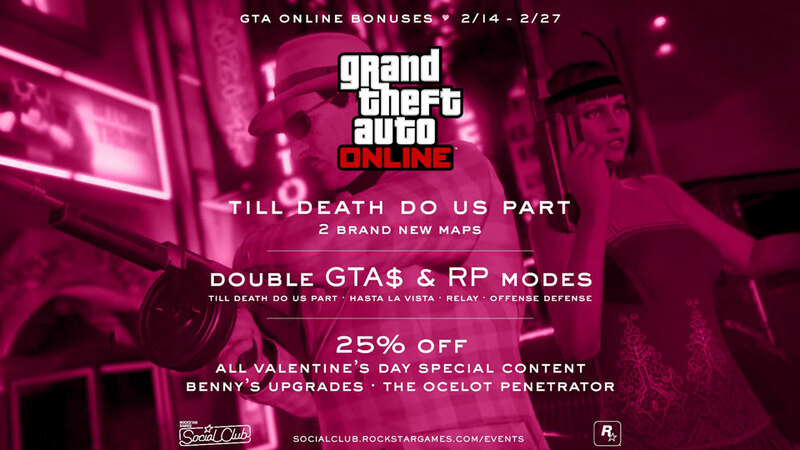 In addition, other 2v2 modes like Hasta La Vista, Relay and Offense Defense are getting some Double GTA$ & RP love, giving you and yours a bevy of modes to dive into this Valentine’s Day. Feel bundles of love this V-Day with 25% bonus GTA$ on all Biker Business Sales and Special Cargo Deliveries through the 27th. Keep warm on those chilly nights by cuddling up next to those big piles of GTA$ you’ve stacked up in your Office. 2/21 — 2/27: “Over and Under” (Locked to Bikes). Launch Premium Races through the Quick Job App on your in-game phone or via the yellow corona at Legion Square. 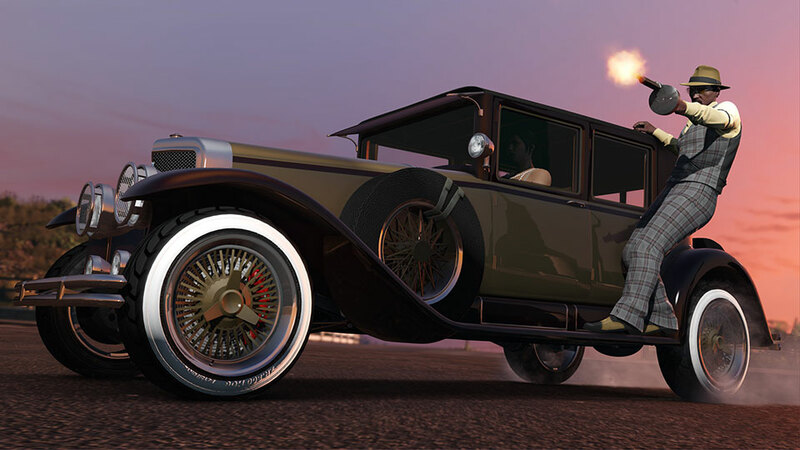 Premium Races pay out GTA$ winnings for the top 3 finishers and all racers receive Triple RP. 2/20 — 2/26: “Cypress Flats”. Head to these locations and enter via the purple corona. Beat par time to earn GTA$ & RP. Vinewood Boulevard Radio’s own Nate and Stephen from WAVVES will be guesting on tomorrow’s episode of The Attack on Twitch to play Till Death Do Us Part, Offense Defense and other ‘couples’ modes in a sure-to-be-hilarious 2v2 battle against Antwon and Workaholics’ Blake Anderson alongside Attack hosts Alex Corea and Erin Steeby. Nate and Steve will also be talking about their upcoming new album and doing some ill-advised IRL stunts in classic Attack fashion. Borgore’s in town playing Terminal 5 this weekend as part of The Savage Tour and will be swinging by Rockstar HQ to get savage in some GTA Online 2v2 action with other special guests to be announced. Follow http://twitch.tv/rockstargames and subscribe to www.youtube.com/rockstargames to make sure you get our go-live notifications.